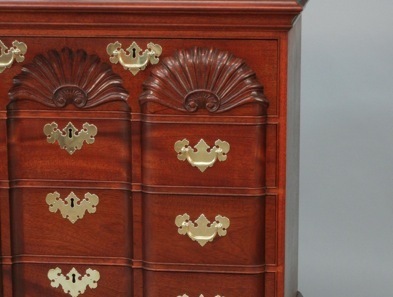 This Reproduction Newport Chippendale Block Front Chest is handmade of solid mahogany. This Block and Shell chest is a reproduction of a John Townsend original made in Newport Rhode Island in the 18th century. I measured two different original chests to ensure every detail down to the bead size on the apron was accurate to the originals.. Examples of this chest can be seen at the Metropolitan Museum, and Colonial Williamsburg. A Newport Block Front Chest “ the Sarah Slocum Chest” sold at Christie’s for 4.7 million dollars in 1998. Different chest with the same design were made by John Townsend in Newport,Rhode Island from 1750-1792. 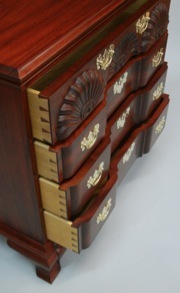 This chest is handmade with the same techniques as the original. Hand cut dovetail joinery throughout, hand shaped drawer fronts and drawer dividers and hand shaped moldings to match the originals. The three shells on the top drawer are hand carved. If you are interested in a chest of this design, another style block front chest or any other antique reproduction furniture Contact Us with any question you have or to get a quote.